Three months ago I'd never heard of CrossFit but was hoping to get back into training after a year or so of low to no exercise and not being in the best of places. I saw a film on Netflix about it and was so impressed that three days later I was at my first beginners lesson, totally excited to try something that seemed communal, friendly, humble yet really tough. to try things that are totally new to me due to the emphasis on total body and mental fitness. There's such a sense of comradery, with regular social events that would never happen down your local gym. There are people from all backgrounds, ages and levels of fitness that attend every WOD (workout of the day) which I've found so refreshing and encouraging, as I'm a guy who gets intimidated by the gym, so the diversity is amazing and there's absolutely no bravado, just a bunch of incredibly supportive people who not only make strength and fitness training fun, but rewarding too. Every class (bar a few) is completely different, focusing on strength and fitness and for your money it's such a great deal as you're practically getting a personal trainer for every hour WOD you attend which for your money is unbeatable. Every WOD is conducted with expertise and they are always a challenging surprise, but lots of fun. I'd honestly say that CrossFit has changed my life in such a short time as it's made me feel so good about myself and made me look at fitness in a completely new light, and I can't believe the things I'm now capable of in comparison to my abilities and fitness three months ago. I'm literally lifting twice or more of the amount I could when I started and my core strength, endurance, cardiovascular and mental fitness has shot through the roof, and it's all thanks to the incredible and passionate staff at CrossFit Avon. They genuinely care about every single person's progressive journey. It might seem more expensive than your average gym, but this isn't 'your average gym'. I've gotten so much more out of CrossFit Avon in three months than the last ten-years worth of gym membership, and discovered a global community I want to be part of for a long time. Couldn't recommend it enough. I looked to Crossfit after being dropped from the England Rugby team. I wanted a new venture, something that was competitive and exciting. I had heard about Crossfit and the many advantages of it, but nothing I had been told even came close to the experience I received. I usually trained in the mornings as part of the illustrious 7am crew 5 days a week....I even did a cheeky little competition (and loved it...shh!). I found I got nervous excitement every time I turned up to see what workout would be written on the board (and the feeling of dread when you saw a hero WOD!) but no matter what, at the end of the hour you feel like you have achieved so much! For me, Crossfit is perfect, because the workouts are varied so you never get bored, the people who go are incredible and so friendly, the coaches really are so knowledgable and helpful, and it lets me release my competitive side. Over the months I received invaluable individual coaching on lifting technique, I got fitter, and I got more powerful. Transferring this onto the rugby pitch 12 months later, I have been re-selected for my country, which is the biggest honour imaginable. Something in me believes that this can't just be a coincidence! Without Crossfit Avon I wouldn't have been able to have trained to the standard I have this year, something I can't thank them enough for! So if you're still 'umming and ahhing' about whether to join, then don't(! )...Crossfit Avon has the ability to change your lifestyle and the way you train forever! 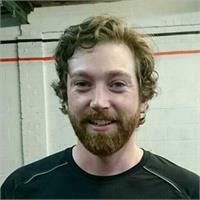 ​I first joined CrossFit Avon in November 2013. I was tired of how busy my current gym had become even during off-peak times. I had become more than a little frustrated at never being able to use the equipment I needed to get my workout done! I was peripherally aware of CrossFit and the kind of exercise it entailed (functional movement, weights, conditioning etc.) so I thought I’d try it out. The class format (max. 12 per class) ensures there is always equipment and space to get the work done. In my first beginners class we covered some basic weights movements and we then moved onto my very first WOD. Ouch. Before my first session of CrossFit I considered myself to be relatively fit. During my first session I had to re-evaluate due to the whole new level of challenge I was confronted with. After catching my breath and peeling myself off the floor I realised that this was the kind of challenge that would help me progress in my fitness. I was instantly hooked (albeit a little sore). ​After completing the beginners’ classes and entering the mainstream I set myself a few goals (increase back squat [in progress], and perform all WODs as prescribed [definitely still in progress]). I started out at 2 x sessions per week and built up over time. I now attend CrossFit 4-5 sessions / week. In my time at CrossFit Avon I have made progress that I never would have believed; increasing strength, fitness and stamina. I have also achieved feats that I would have previously thought out of my reach; from lifting heavy things over my head, to handstand-walking, to competing in a weekend team event. Never being one to easily gain muscle in my previous strength-and-fitness life; since starting at Avon I have put on nearly 2 stone(!) in muscle – all whilst improving my fitness, speed and even those tricky body-weight gymnastics movements. The community at CrossFit Avon also warrants a mention. I was at first sceptical about CrossFit mostly due to the community aspect. I was previously a “headphones-in-don’t-talk-to-me” gym goer. However I have truly met some brilliant people at Avon and most look forward to interacting with my fellow athletes and cheering each other on during those WODs (I was even given the “Spirit of Avon” in my first year – so quite a turn-around). The Coaches truly are all fantastic and I couldn’t name one that hasn’t contributed to my fitness or development of one skill or another in some way. You couldn’t hope to be coached by a better or more qualified bunch. CrossFit has definitely helped me to move from a maintenance mind-set to a progress one. 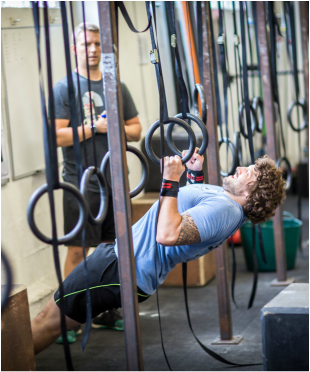 I would highly recommend CrossFit and CrossFit Avon – but only if you want to progress, have fun and meet some fantastic people. I started going to CrossFit Avon in February 2015 after finishing treatment for cancer (Hodgkins Lymphoma). I am 39 and for the last 10 years, I have had a basic level of fitness, participating in a number of 10k events and also been a member of a local Health Club / gym (Bannatynes). I lacked direction and found myself either plodding on a treadmill or around the Downs. Cancer had made me put on some weight and also given me a bit of a drive to make some positive changes. I was initially attracted to join CrossFit Avon by their promo video and wanted to do something different. I have always considered doing bootcamp / military fitness style classes, but have been put off by their restricted timetables. CrossFit Avon has class times to suit a wide range of people and have enabled me to attend as frequently as I have needed. Initially, I found it quite daunting, but everyone was so friendly. I remember finishing my first few classes last and all the other people were clapping my efforts and encouraging me to finish. In most classes you have to work in pairs, so social interaction is guaranteed, which is great. I joined with a target of completing and feeling competitive at the Rat Race Scotland Coast to Coast event, which is a 2 day endurance / adventure race and signed up to a blend of Personal Training with Andrew and regular classes. Andrew has given me a great programme, mixing in sessions at the gym, local parks and home. ​CrossFit globally has been criticised by many in the past for poor training, but I have been very impressed by the coaches at Avon and their focus on our form during classes. I have done things that I never thought I would do. I rarely used to venture to the free weight area of a gym - now I love the olympic weightlifting. Another highlight for me was achieving a handstand. It may not seem like much, but I was never given the confidence to do one at school and did my first one within 3 months of starting at the age of 38. Click A friend had badgered me for years about trying CrossFit but I was apprehensive from mixed reviews I had heard on the training, I went to Crossfit Avon and couldn’t have been more wrong to have been concerned. The coaches really focus on technique and push you in the right way to achieve the goals you want. If they feel you’re not doing something correctly (regardless if you’re going for it during a workout) they will stop or slow you down to ensure your form is right. Despite being in a group personal training environment they are watching everyone and if you’re slowing down they really encourage you to finish. If you are unable to perform the exercise they have programmed for that day or have a particular injury they will adapt the exercise to suit you or scale the workout down to something that is more manageable for your capabilities. here to edit. Unlike conventional gyms where you have your bolshie meatheads hogging up the weights, you have a vast amount of equipment in a class that is mixed gender, age and ability and is friendly and supportive. I walk into a session knowing everyone’s name and them knowing mine. The workouts are enjoyable and laid out to be a completely different set of muscle groups or cardio programme to what was done the previous day, no two days are ever the same. I play a high level of rugby along with the occasional game of squash, golf and surf, Crossfit has immensely improved my fitness, strength, flexibility and balance to the extent that I have seen improvements in all these sporting activities but especially the rugby. In the last year I’ve shredded body fat, maintained a suitable weight and massively increased my pace and stamina so that on the pitch I am able to dominate and think about my positional play more rather than just gasping for air. The gymnastic side seemed daunting at first, especially for an eighteen stone rugby player but once mastering the techniques it comes naturally and has strengthened my core; it’s also a great showboat to see a bloke of my size pull out a handstand walk! I have always known that flexibility is important but Crossfit Avon really enforces it and the mobility exercises they teach have definitely influenced some of my stronger Olympic lifts. Aside from optimising my fitness and strength, one of the best things about Crossfit Avon is the community of members. Everybody was so friendly and approachable, everyone in the class encourages each other, and the only competitiveness is with yourself as everyone is at different fitness levels in the class. My girlfriend and I were new to Bristol when joining the club but due to the social environment and the outside the gym activities they put on we have developed a large friend base here. I highly recommend giving crossfit a try to anyone and I guarantee Crossfit Avon’s teaching methods and atmosphere will get you hooked, cheers to the coaches for all the help and encouragement. Although I have always been reasonably active, I gave up all regular competitive sport whilst still at school – probably at about the age of 14. Forty years on, I have found the aging process less than kind, and currently suffer with arthritis in all my joints making activity quite painful at times. So it would have been easy to dismiss my ambitions to get really fit, by thinking it was too late. The combination of being older than nearly all my classmates, and imagining a macho gym environment had the potential to put me off Crossfit. Not so. I found plenty of other women; the guys are friendly and the atmosphere is very inclusive, meaning that I don’t feel self conscious about my age, or level of ability. Everyone helps each other and I love the way that we all introduce ourselves to newcomers, and the whole culture of support and encouragement. I will probably never want to go in for serious athletic competitions, but there are many things I do want to do and Crossfit has helped me make great inroads into achieving these. For instance I am sure that the physical confidence that I am developing as a result of getting fitter is what has enabled me to take up horse riding again after a lapse of about twenty years and to start hiking up mountains. Both of these activities make me feel free and energised and like I’m living life to the full. I’ve lost weight and feel great. After reading Andrew’s post on the Crossfit website about climbing Ben Nevis with Amelia I decided to try and attain a lifelong dream to climb the 3 highest peaks in Britain. As part of my training I recently camped in the Brecon Beacons and set off on the 9 ½ mile Brecon Beacons Horse Shoe Walk which included ascents of Cribbyn, Pen y Fan and Corn Du. It was a blast! The views were astoundingly beautiful and I had a wonderful feeling of achievement. Two weekends later I went to Cumbriawith my partner and brother and we climbed the highest peak in England–Scafell Pike. It felt fantastic! Thanks Crossfit for all your help – life is so much better. Never a natural athlete, I became a fitness enthusiast quite late in life when I joined in with the Circuit training classes Andrew used to run in St Andrews and St George parks. I spent half the first session doubled over gasping for breath, but soon caught the training bug and started turning up regularly. The CrossFit workouts we do now at Merton Rd are more intense and demanding than circuit training. Sometimes the WOD (Workout Of the Day) seems beyond what’s humanly possible! But you get on with it and sooner or later you find you’ve done it. The use of different weights etc means WODs can be geared to different abilities, and scores are recorded so you can follow your progress. I’ve made a lot of new friends in the class and always enjoy the sessions, usually training at least five times a week. There is an excellent mutually supportive spirit, and everything you do is under expert supervision from trainers who seem to have infinite patience – which they sometimes need to have with me! I’m picking up a lot of new skills such as beginning to get the hang of double-unders (skipping) and all the various Olympic weightlifting techniques. Kipping pull-ups and handstands are beyond me at present but we’ll get there. I am now fitter and stronger than I’ve ever been before. Where there used to be a paunch is now the makings of a six-pack and my clothes are starting to hang off me. My physique is noticeably leaner yet more muscular, as several friends have remarked. I’m sure CrossFit has helped me discover the lust for life that perhaps I was losing before I started – and I hardly ever find myself falling asleep in the afternoons now like I used to! All-in-all, at 53 years old I’m in the shape of my life. But I keep chipping away at my personal bests on all the workouts and I know I can keep improving, and having fun doing it. I found Crossfit Avon after becoming frustrated with a lack of progress from the repetitive fitness classes I was doing at a local gym. It was one of the best decisions I've ever made. Within weeks I was fitter, faster and stronger than ever and over the last 2 and a half years I've gone from barely being able to do a pull up to competing for Crossfit Avon at one of the largest team competitions in Europe! The staff at Crossfit Avon are top notch and along with the amazing members cultivate a real sense of community. The programming is extremely well thought out and the knowledgeable coaching staff have great attention to detail and always know how to help each individual progress. Can't recommend it enough. I had struggled maintaining my weight after losing almost 5 stone through mainly diet over the past few years, with a love/hate relationship with exercise. I have been a member of many different gyms and tried every different class imaginable but never managed to stick to anything long enough to see real results. A friend of mine suggested Crossfit and after another few months of being too terrified to try it (what if I can't do it?/won't be able to finish a workout/will make a fool of myself etc etc), I finally decided to give it a go and I have not looked back. That was the end of April this year and since I have started I have gotten fitter, stronger and lost several inches all over-all while having fun in the process! The workouts are constantly varied; you never know what to expect-and therefore never get bored! While they are often very challenging, there will always be people cheering you on and pushing you to go that extra mile. The community at Crossfit Avon are so friendly and supportive, there are regular social events which will make you feel welcome. Finally, what sets Crossfit Avon apart from other Crossfit boxes is the quality of coaching. The coaches are incredibly attentive, always teaching correct form and always happy to help with any questions you may have or advice you may need. If you are looking for a challenging workout in a fantastic environment I can't recommend Crossfit Avon highly enough! I discovered CrossFit Avon after Andrew ran a fitness session for some of my scouts. He gave me the marketing speal and I thought I'd give it a try. 18 months later and I am still loving it all. The community here is great, always feels good walking through the door, being greeted by everybody. The WODs are intense but mostly good fun. The Olympic Lifting classes are great for improving technical ability. The coaches know everybody by name, and there is a social every month or so - always a big turnout.